A variety of traditional English and Irish songs and some enchanting originals in the traditional style, which will have you laughing, crying and drinking as you sing along. Be it original works by our own talented song writers, or innovative arrangements of period pieces, Lost Cause provides a new look at ancient carols, bawdy Elizabethan rounds, and English and Irish traditional folk songs. Drawing from various and sundry sources, we look to put our own entertaining and enjoyable spin on forgotten classics. Initially inspired by the local Pyrates and other traditional folk groups, Lost Cause is a seven person mostly a cappella group centered in and around Columbia, MD. We perform a wide range of traditional music both in historical reenactment groups, as well as along side modern a cappella groups. 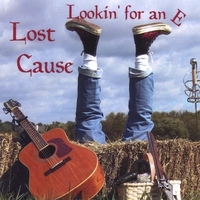 Lookin' for an E is Lost Cause's debut album, recorded over two years to find the perfect mix of humorous drinking tunes, historically inspired war anthems, sea chanteys and songs of longing for love or home. Please visit our website: http://musicbylostcause.com for performance information and some funny pictures on and off the stage.